Comprehensive review of Lorac selfTANtalizer Body Bronzing Gradual Self Tanner. See what the experts and actual users have to say about this self tanning product. Initially, we were excited to try this product. Unfortunately our excitement was short-lived once we opened the bottle. After thorough testing, Lorac selfTANtalizer Body Bronzing Gradual Self Tanner is one of our least favorite self tanning products on the market today… and that’s putting it nicely! To start with, this product is an absolute mess to apply. In addition, the color isn’t great, it smells bad once it dries, and it’ll come off on your sheets, clothes, loofahs and washcloths over the course of several days. Lorac selfTANtalizer comes out as a medium brown-colored lotion. It’s consistency isn’t bad, but it’s got quite a bit of guide color in it. This is where Lorac selfTANtalizer really fell on it’s face. This product is a real pain to apply. For one, it doesn’t blend in very well with your skin. That means it takes a lot of work to get it absorbed… more work than most people will want to put up with. Second, the lotion has a dark color guide in it that will get on EVERYTHING. So expect to see dark color on anything you touch for the following 8-10 hours after application! Overall this is one of the most difficult self tanners to apply correctly. Expect it to take a ton of time (especially doing cleanup). Lorac selfTANtalizer is about average when it comes to drying time. 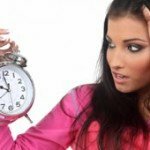 It really doesn’t take much longer than most other products on the market. The problem is, this self tanner keeps coming off even after it’s dried. Our bedsheets were a mess the following day and we even noticed our loufa turned permanently brown the next morning when we were washing it off in the shower. Most self tanners that have guide color in them wash off easily in the morning after application. Not so with this product. It took messiness to a whole different level. Lorac selfTANtalizer actually smells really good when you smell it right out of the tube. It almost smells like chocolate ice cream or pudding. This is one of the reasons we were so disappointed with selfTANtalizer, the smell is so good it got us very excited! So much for the pleasant smell right out of the tube. Once we applied this product, the smell changed to ‘really bad’. We’re not sure if it picked up the smell of the latex gloves, or if something else was going on, but the smell got really bad really quickly once we applied this product. 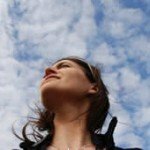 The unpleasant smell persisted into the next day as well. The color produced by Lorac selfTANtalizer was average at best. We did notice some orangeness to the color and a little bit of streaking. The color lasted about 3-4 days, which again is about average compared to other self tanners. Dudes should stay away from this product. It’s way too messy and will frustrate men when it gets all over everything the day after application. 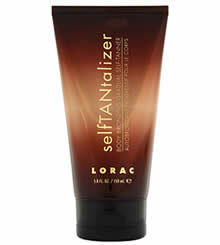 Coming in at about $6.80 per ounce, Lorac selfTANtalizer Body Bronzing Gradual Self Tanner falls on the expensive side. Especially when you consider just how bad this product performed. To buy Lorac selfTANtalizer Body Bronzing Gradual Self Tanner, click here.